Sebastien Le Toux retired as a Union player this week. The Frenchman was an icon in Blue and Gold, on and off the field, and will be remembered in team lore forever. Interestingly, Le Toux was also a dimensional traveler, a man who was never meant to play in this universe. The Frenchman came from a different universe altogether, a universe where black is white, up is down, and where the Union are MLS Cup Champions. There’s a universe out there where things have gone better. There’s a universe out there where “That’s so Union” is an exclamation of pride, success, and promises fulfilled. There’s a universe out there where Union fans all but ignored the Philadelphia Eagles’s Super Bowl victory, having so many of their own trophies to count already. There’s a universe out there where the Union ownership are the preeminent group, beacons of league leadership. There’s now space in a season already going sideways to think about that universe and what might have been (or, more accurately, what actually was somewhere else). These are the players who put it all together in another universe out there, but couldn’t quite make it work here. Zac MacMath – The lanky net-minder always seemed to be valued for his faults and not his contributions. He went through a number of injustices, the most famous of which were the Union drafting Andrew Blake at the top of the 2014 MLS SuperDraft and the awkward press conference just months later where then-interim coach Jim Curtin sat silently as World Cup hero, Rais M’Bohli, was introduced. Austin Berry – The former MLS Rookie of the Year never got a fair shake in Chester, falling on the depth chart behind Ethan White, Steven Vitoria, Richie Marquez, and (eventually) Maurice Edu. He took an “Eat, Pray, Love” journey after that, with a particularly fetching season in Korea’s first division. Bakary Soumare – A former 2nd overall pick by Chicago in the 2007 MLS SuperDraft, the mercurial Soumare’s highest achievement was likely appearing for Malian national team or captaining the sinking ship that was relegated French side, US Boulogne. He played all of 4 matches for the Union before being dealt back to Chicago. Michael Orozco – Do you know what American defender scored the only goal in the United States’s only-ever win at Mexico’s Azteca Stadium? Former Union defender Michael Orozco. Here’s proof. Jordan Harvey – All things Fabinhno notwithstanding, the Union have only ever had one true Left Back. When he was shockingly shipped to Vancouver in the middle of an otherwise brilliant 2011 campaign, Union fans couldn’t have ever known the black hole he would leave behind him. Maurice Edu – The most important signing in team history was a selfless servant to the often nonsensical whims of John Hackworth and Jim Curtin. From central midfield to central defense, Edu played two somewhat solid seasons before disappearing for two more because of injuries. Amobi Okugo – Many nostalgic Union fans consider Okugo to be the team’s greatest bust with regard to youth development. Taking a poised defensive midfielder and having him cover in defense next to an ever-changing list of less-than-capable counterparts didn’t do much for his development. By the time Okugo moved on, so had the league. Kevin Kratz – The German parked his car for free in the Union’s lot for a few months, then moved to Atlanta without so much as a goodbye. Considering what he’s done since, a savvy team might have gotten a bit more out of that relationship than a 4th Round pick in the 2020 MLS SuperDraft. Freddy Adu – There isn’t a joke left to write or a “what might have been” story to tell about America’s next Pele that hasn’t already been done. Adu has lived every possible universe already, save for the one where he’s allowed to blossom in good and deliberate time. Zach Pfeffer – In the end, Pfeffer’s Business degree from Temple University will be worth more every year than any contribution he could have made to MLS. It’s tough to argue that this universe was one that maximized his talent, or that put coaching behind him and players around him to find out. Kleberson – The only World Cup-winner to put on a Union shirt, and the best player to ever sit in the team’s doghouse. Just because he was brought here solely because Freddy Adu could be dumped in exchange doesn’t mean he wasn’t better than every player above him on the depth chart. He was, by a lot, but had fewer appearances than Keon Daniel or Antoine Hoppenot. Roger Torres – Torres is the answer to the Union question, “Who is the most creative player in Union history?” That his tenure in Philadelphia included one of the most memorable goals in team history as well as some of the most inexplicable time on the bench in team history should be maddening just to read aloud. His story was the beginning of the nonsensical argument Union coaches have made valuing practicing hard above helping the team win during matches. Michael Farfan – Dan Walsh already covered what happened to Michael in this universe. That chip against Madrid, though. Vincent Nogueira – There’s one universe where the best player to ever put on a Union shirt went home for love. There’s another where he did it to take care of an ailing family member. Yet another where he did it because he missed brie and baguettes. Because he never said why in this universe, Vincent Nogueira will always be the one who got away, and for some Union fans, that wound will never heal. Jack McInerney – Quickly, unceremoniously, and without warning the former National Teamer was sent north of the border for Andrew Wenger. Rumors abound as to why, but Jack Mac had trouble with his anger and with consistency. In this universe, those things might make a player disposable. C.J. Sapong – The debate in this universe goes something like this: Sapong is either a good player with a long list of players around him who don’t move off the ball, don’t check to the ball, and do little else with the ball than swing in aimless crosses, OR he is a wildly overrated player with no touch, no shot beyond four yards, and a very clear ceiling. Sebastien Le Toux – The Union’s G.O.A.T. was still traded twice, neither transaction resulting in anything positive for the franchise. In Le Toux’s home universe, he’s not a 50 goals and 49 assists guy, but rather a 150 goals and 149 assists. That, in finding this broken universe and staying, he blessed this group of fans with his “joie de vivre” is nothing short of a miracle. There’s a universe where, after the Phillies declined to put Citizen’s Bank Park downtown, the Union built their stadium there instead. In that universe, interestingly enough, few if any families ventured to the stadium to see a match. Rather, the stands were packed full of hipsters, people on their first Tinder dates, Stacys and Chads in their business attire after a long 9-5, a number of other stereotypical urban-ites (perhaps home-brew enthusiasts and beard balm aficionados, although the demographic overlap between those groups likely seems high), and the kind of unpredictable and energetic walk-up crowd that no other sports venue in the region could offer. There is a universe out there where things have gone better. Union fans know this universe exists because Sebastien Le Toux came from there to show them it was real. Take consolation in that fact, loyal fans. The Boys in Blue win MLS Cup in this universe again in 2018, their 9th in a row. They even kept the gold bib and decided a mascot was a foolish idea because it might detract from their wildly lucrative Wawa/Comcast joint venture shirt sponsorship. Doesn’t help that the stadium is still in Chester..
That was great and I hate you for publishing it! Soccer fandom is supposed to hurt right,coupled with giddy joy? That’s how I know I’m a fan and the Union are a real team right? Okay, now let’s have a championship or two!! 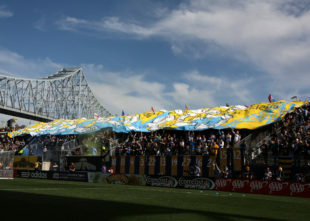 Here’s to hoping the Union folds and proper investors bring a proper team to a proper location in the City of Brotherly Love. When articles like this get published the nine years of heartache become all too real. We’ve been mistreated by team ownership and mistreated by Lady Luck. What can be done? Califf, LeToux & MacMath suffered the most egregious wounds by Union hands. There’s a wrong way to do things, then there is what happened to these guys. Multiple times over.